Sureclean provides industrial cleaning and waste management solutions to the power industry. Sureclean’s service range is routinely deployed to support call-off projects, regular maintenance or full system shutdowns. Over the years, Sureclean has amassed experience in the extended energy sector encompassing nuclear, fossil and, more recently, onshore and offshore renewables. The company’s expertise varies from undertaking ad-hoc cleaning activities to supporting full shutdown / outages where extensive maintenance programmes, and other critical path activities are completed. 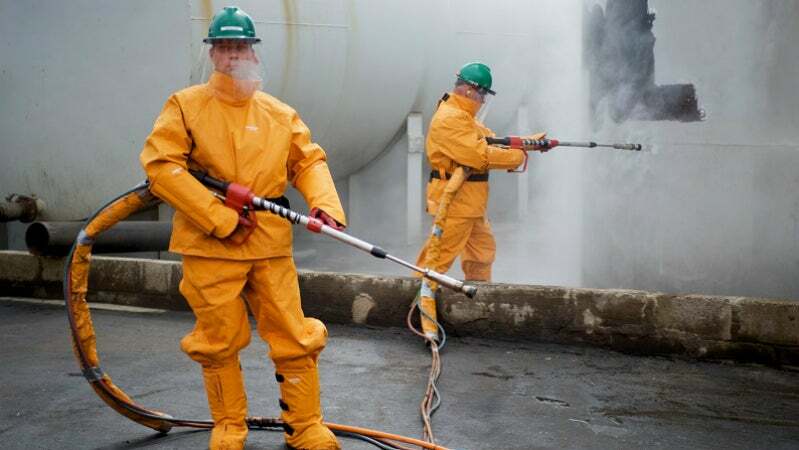 Previous projects have included asbestos management, solids removal using vacuum transfer technology, tank and vessel cleaning, confined space entry working, the provision of emergency response teams (ERT) and HP and UHP water jetting. In the downstream sector of the oil and gas industry, Sureclean supports oil refinery, gas processing and petrochemical plants. Sureclean provides the necessary services to effectively maintain the integrity of processing units such as desalters, distillation vessels, hydrotreater systems, slug catchers, catalytic units and storage tanks. This is accomplished using Sureclean’s extensive range of certified equipment and highly trained jetting, confined space entry, emergency response and asbestos removal teams. Sureclean has undertaken various decomissioning projects across a range of sectors. Recent projects have included asbestos surveying, sampling and removal from nuclear facilities; cleaning dismantling and removal of redundant pipe work from refineries; cleaning, dismantling and removal of processing systems within power stations and cleaning and dismantling of redundant tanks within the petroleum industry. Sureclean has an asbestos management contract to support decommissioning activities at the Dounreay Nuclear Power facility. Sureclean were contracted by DSRL to provide ongoing asbestos management services during the decommissioning programme, including consultancy and training; as well as surveying and sampling and asbestos containment, removal and disposal with a permanent on-site team. Sureclean has so far completed various asbestos removal projects, in strict compliance with governing legislation, subjected to independent third-party audits (ARCA). During a planned maintenance outage, Sureclean were commissioned by the principal engineering contractor to complete the works associated with the cleaning of the steam turbine oil system pipework. The steam turbine oil system pipework varied from 2in to 14in and was cleaned using HP water jetting techniques with safe residue disposal. Additionally, using Sureclean’s latest generation camera crawler systems, pre and post-clean inspections were carried out. Sureclean were contracted to provide manpower and UHP water jetting equipment to remove an expoxy resin from the 1in condenser tubes, housed within a tube bundle configuration, to facilitate internal rotary inspection systems (IRIS). The client had previously tried a number of cleaning techniques, including chemical cleaning, which were ineffective. The resin lining was internally located 6in form the end of each tube which added to the difficulty factor. A safe and effective system was implemented by removing each bundle from the main system and locating it within a designated washbay to provide access from both ends. Each condenser tube was cleaned individually utilising semi-automated lancing system at pressures of 2,000bar. Arran Mackie and Mathew Pirie have both been shortlisted for prestigious Aberdeen Business Awards. Formed in 1985, Sureclean is an established international service contractor providing specialist and innovative solutions to the Oil & Gas, Petrochemical, Renewable, Utilities, Civil Engineering and Construction sectors. Sureclean and Nordic Chemical Solutions (NCS), the specialist provider of decontamination chemistry, have partnered.